A lot of customers have asked us why we picked the battery that we did. A lot of factors go into a good battery beyond the obvious goal of reliability. The most important factor for us was being able to pair our atomizer’s ohms of resistance (from the coil) to the voltage and amps output by a battery. Only by doing the math are you going to find that perfect puff. Too little gives you a weak hit especially in colder weather, and too much overheats your oil and spoils the taste, potentially also encouraging leaking and clogging. So our main goal? A reliably potent hit that won’t leak, clog, or otherwise fail. Capacity: At 280 mAh, this battery generally gets you through a half gram atomizer on a single charge. Reliability: We’ve found their failure rate to be so low it’s negligible. Adjustablity: If you’re on a chair lift and it’s zero degrees out, you’ll thank us. It’s a pow shredding gift. Compatibility: It works with top air flow atomizers like our Pure Pen. How long can they hold a charge? The length of time your battery works varies based on factors such as how long ago you charged it and the ambient air temperature. Colder temps drain a battery faster, and with thicker oil you’ll likely demand a bit more battery oomph to get you to your happy place. We put the control in your hands, meaning we don’t dictate your temperature, hit size, or flavor temperatures. 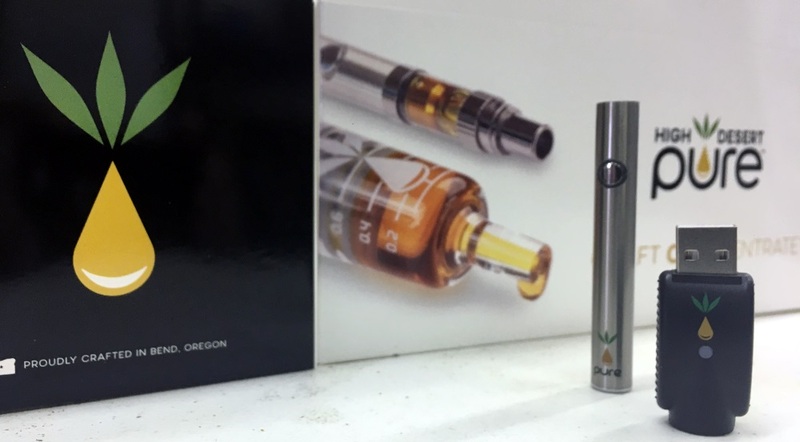 We take your enjoyment of our premium craft oil so seriously that we chose a battery that lets you adjust the heat just how you like it. To get rolling, click the battery button three times. When it flashes green, you get a low heat. We think level let’s you taste the oil at its finest. Flashing blue means medium heat, while flashing red means high heat. Beware of high heat because if you’re not careful, you might burn your terpenes. That would make us cry, or at least stomp a foot. Want a manual? We’ve got your back. Click here for one. To activate your battery, click it five times. You will see a flashing multi-colored light ring around the button. If you don’t, charge it! To deactivate it so that it won’t accidentally turn on and burn through your oil (i.e. if you put it in your purse or pocket), click it five more times. To turn it on, just hold the button down and inhale. The led color tells you what heat setting you’re on. Clicking the button twice will preheat your atomizer, which can be handy if it’s really cold out. Want more help? Check out our atomizer page for more tips or watch this video for other useful tips. Remember to subscribe to our YouTube Channel.